Install this Deterrent Light in your Home backyard and Porch to thwart the attempt of Burglary. This PIR Motion Sensor based light switches on instantly when it detects a Human movement from a distance of ten meters. The light turns on for 3 minutes and then turns off. It Re triggers again if the movement continues. 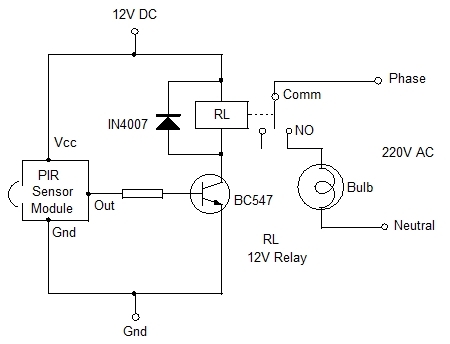 Relay is used to drive the load, so any kind of lights can be used.